Good morning , good evening and good afternoon to you all. I trust you all had a fabulous Christmas and are recovering nicely. Last week for me was bittersweet with my mad dash to London ( for five hours ) for the funeral of my dear friend Robert and then back home to Greece to work around the clock and be cheery in my shop. I have to say that there was so much love in the church for this beautiful man it was more a celebration of his life and we all felt his presence around us. 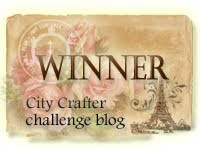 Anyway like most of you not really had much time for crafting let alone blogging and my commenting has been willy nilly ( craftingclaire will put me right on the spelling `). So when I popped in this evening to see what was going on I saw a few challenges that I could participate in. Hence the title of my post ” Anything Goes ” The craft room ( whom I love by the way ) and Top Tip Tuesday both understanding how we are feeling at the moment have decided to be lenient with us and and given us free reign ! So no excuses for not entering ! 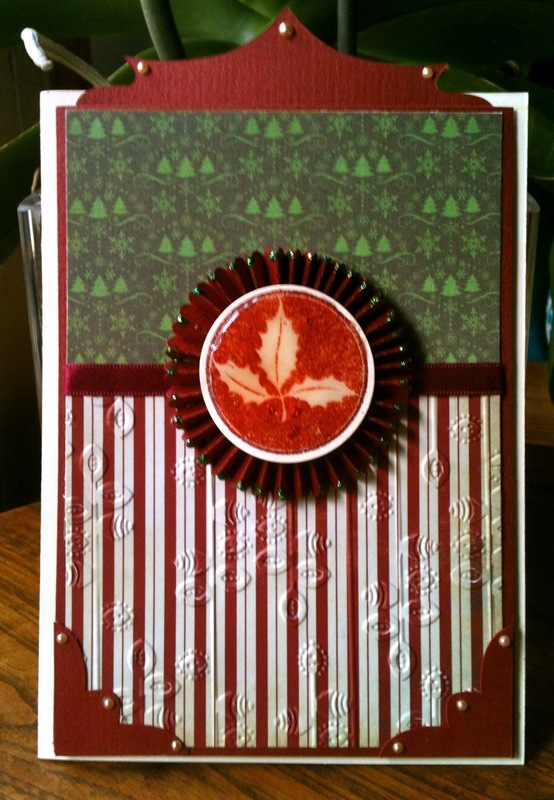 I thought I would share some cards for Christmas that I made but didn’t have time to blog. I know I have missed the boat and should have moved on to Easter or at least Valentines but it is a pity not to share these little beauties with you. In other words didn’t have time to make anything ! 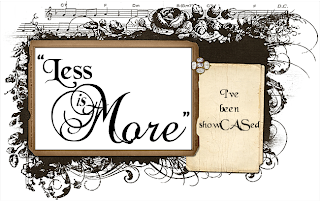 Have used Waltzing mouse stamps on both cards DP papers and pearls from my stash and Tim Holtz on the edge dies. Another one of my creations !! 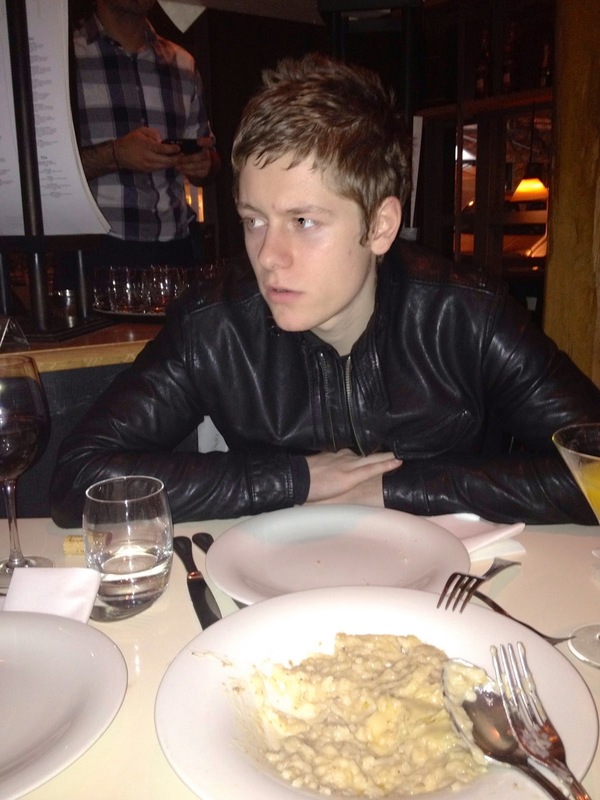 my 20 year old son Alexi who stepped into the breach and took charge of our shop while we went to London he had never worked there before and believe you me it was a very daunting task. We received glowing reports on our return from friends and customers we are so proud of him. Right am of to bed ! four more days of constant work and then with 22 friends we are off for a little trip for new years to an outdoor spa in the mountains. 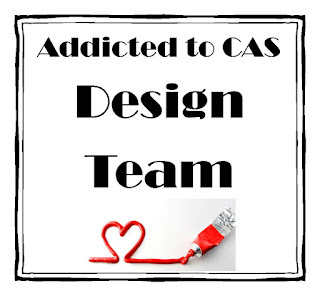 Oops nearly forget , do pop over to the Craft Room and Top Tip Tuesdays to see what their fabulous design teams have come up with. As you are reading this I am on my way to London for the funeral of Dolly’s husband Robert unfortunately due to business commitments we can only stay for the service and will be returning to Greece the same day so my post may be a little early. Over at Get Creative it is the last challenge of the year and we are asking you to follow the fabulous sketch below. Now I think you will agree it’s quite an easy one and for those of you who are ahead with your Christmas preparations we would love for you to have a go ! 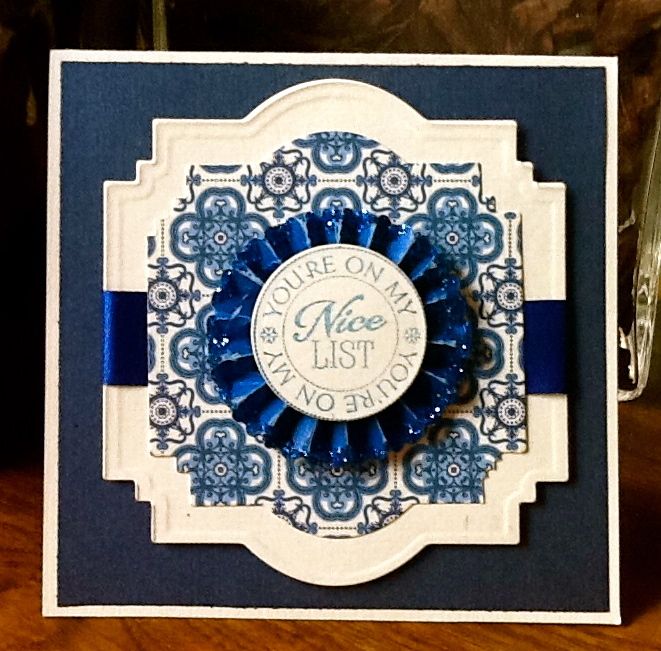 I used Metallic paper to make a rosette using my TH die which I then edged with some glitter. Waltzing mouse stamp for the sentiment ( I love their stamps ) I created my own DP with the aid of my Silhouette and used my spellbinders dies to cut the background. Here I used various DP’s but don’t know whose as the cover has fallen of the pad , now how did that happen !! 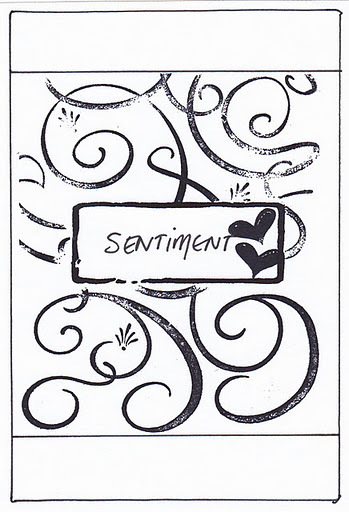 !, Spellbinders die which matches perfectly with the Waltzing Mouse sentiment, did I mention I love their stamps ? Websters pages pearl in the corner and a little inking around the edges. 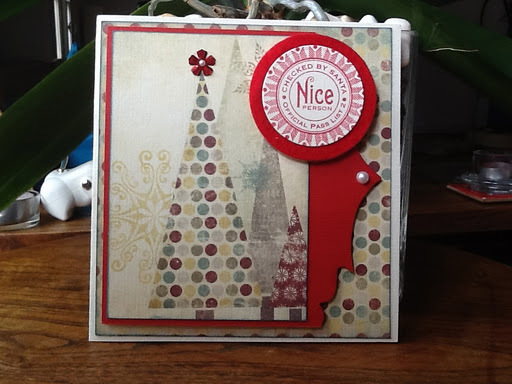 Here I used a TH embossing folder for the background some red felt for the base and once again a Waltzing Mouse stamp for the sentiment I think it’s from their Around Christmas Time set ( did I mention I love their stamps !!! ) a little ribbon a little bling and a tiny pearl and that’s me …..all done and dusted ! and why not take part. We are being sponsored by Unity stamps so you never know you may be lucky and win a prize ! There are currently three other challenges running at the moment so you have until the 28th of December to upload your gorgeous creations. Well am of to catch a plane ( this is becoming a catch phrase of mine ) Wishing you all the best of health first and foremost, love and peace and for those who celebrate wonderful holidays with your loved ones. 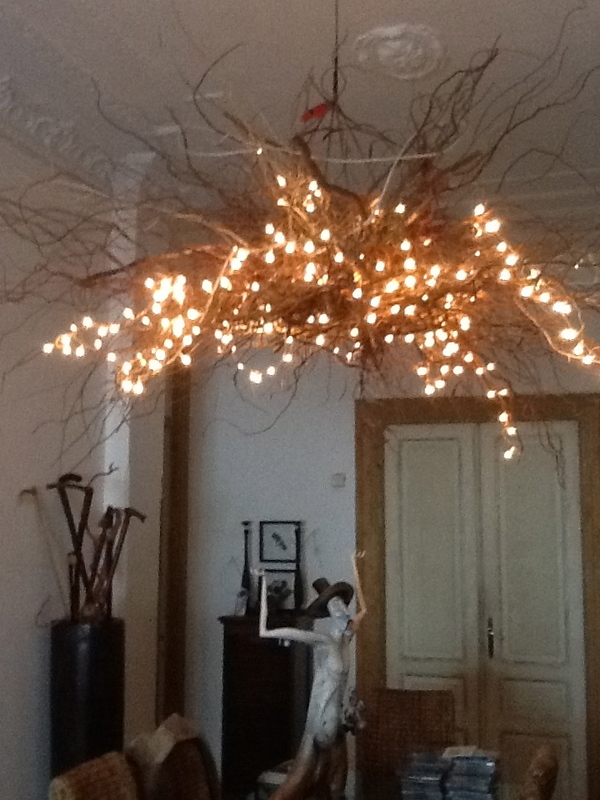 Before I go thought i would share a few pictures of my Christmas lights with you. Although to be honest these ones are in use all year long ! 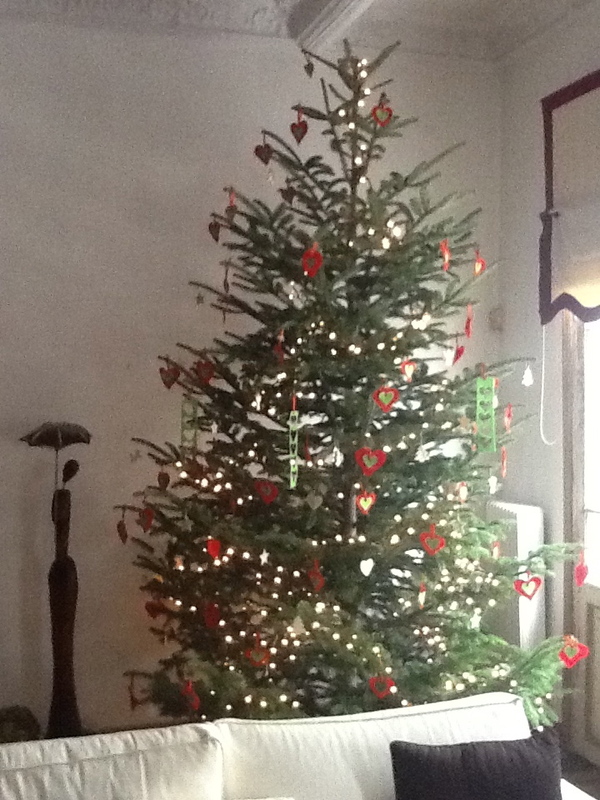 My tree which looks tiny in this picture but is in fact four meters tall, we had to cut the top as it was hitting the ceiling !! it has over eight hundred lights and all the decorations I made myself out of felt and there are about to hundred of the things !! As many of you will know my blogging and creating has been a little lackadaisical of late due to my frequent visits to London due to the ill health of my friend Dolly’s husband . Yesterday he lost his battle and is now sleeping soundly with the angels. So once again I am of to London to say my last goodbye to our dearest and oldest friend ( he was 54 ) A beautiful man who touched our life in so many ways and was brave and dignified and even kept his lovely Irish sense of humour right up until the end, we will miss you Robert. Now…. er hum she says clearing her throat on to happier things. I recently bought some fabulous stamps from the very talented Claire at Waltzingmouse, I had been ogling her wares ( sounds a bit dodgy ! ) for quite some time and well I just had to have some as you do ! I love her style and was so excited when I got my grubby little mitts on them. I had been wanting to take part in one of her challenges for quite some time and now I can ! Its a sketch challenge and I have to say sketches are a little difficult for me but this one was quite easy so I had a go. 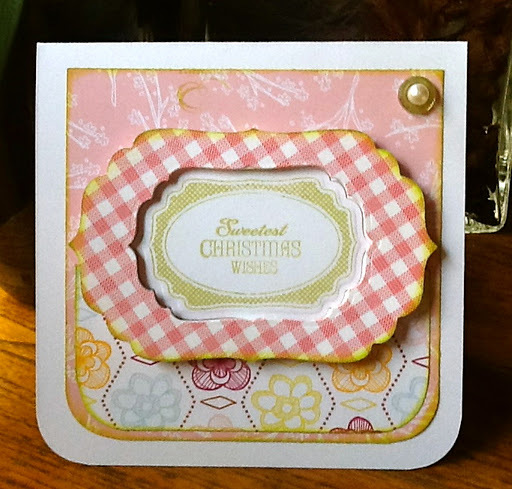 The Waltzingmouse stamp I used is from the set Around Christmas time and it has so may fabulous stamps I didn’t know which one to choose for the best. I stamped it with Melon Mambo ink from SU added a little glitter to the berries and when It was dry added tons of Glossy Accents. 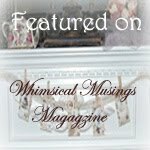 Do pop over to Waltzingmouse to see what the DT members have come up with to inspire us, I have to say they are a jaw dropping bunch of extremely talented ladies and I am in awe of their creativity. 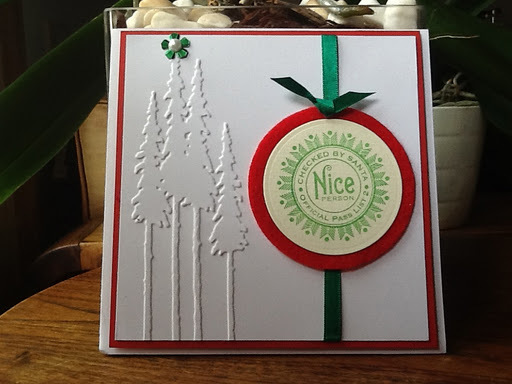 Another favourite challenge site of mine is the Craft room and their challenge for the next two weeks is to use die cuts and punches . 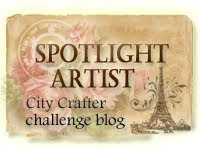 The lovely Nikki has chosen the theme and a great one it is too ! As you can see a lot of die cuts on the above. 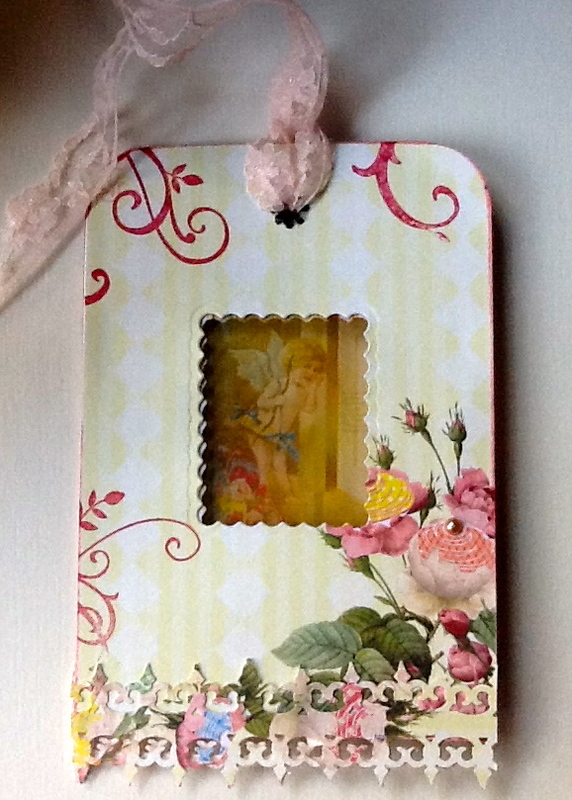 I have used the Tim Holtz rosette die for the centre I added two together and then edged them with green stickles. Have used my Spellbinders circles for the base of the stamp and the TH on the edge brackets die for the top. 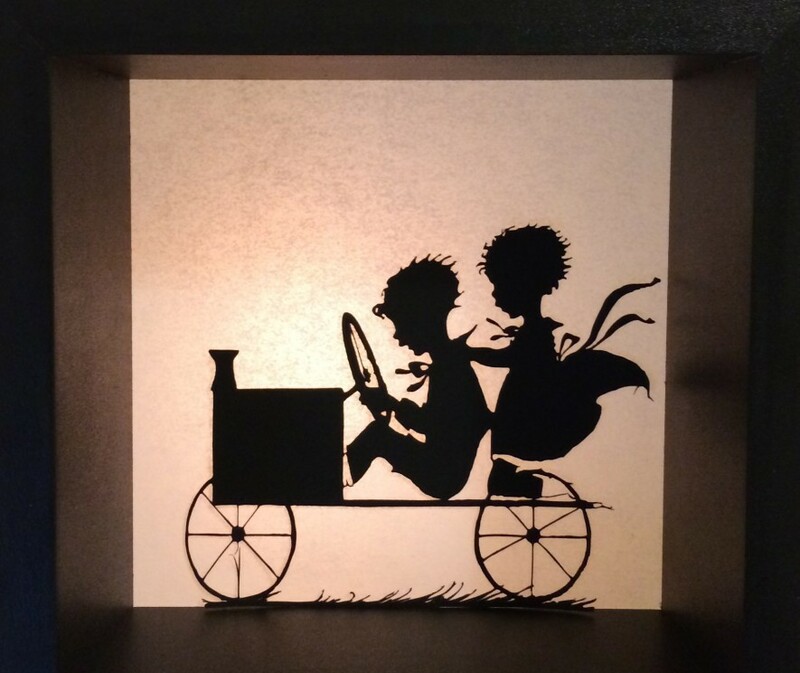 My trusty Silhouette provided me with the bottom corners . The photo does not do it justice I have to say in the flesh it looks quite grand ! Do pop over to The Craft room to see what the lovely DT have created for us I am sure you wont be dissapointed. Right of to work now I am working seven days a week for the next three weeks, one of the joys of owning a jewellery shop ! So as you can image not a lot of time left over for anything , so am apologising in advance for my lack of commenting and what not . Do hope to be back more cheerful and bright in the new year, love to you all and my very best wishes for a happy and healthy Christmas for all who celebrate. There are currently two challenges running and both with the same theme the 1st December being for layouts and the 5th December for cards and the theme is to make a card or layout using ribbon or wrapping paper that you will be using on your gifts . This year I will be wrapping my presents with Websters pages and each person will be receiving a homemade tag using the same paper, this little tag ( actually its not so little ) can be used as a tree decoration so come and see what I made . 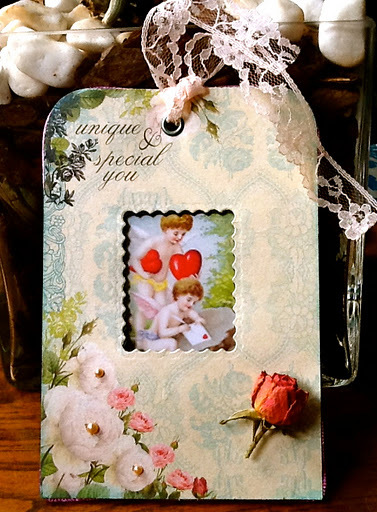 I have used Websters pages to make this double sided tag I have used the SU Swirly stamp for the corners , added some pearls a dried flower and used a Martha Stewart punch for the border to which I have added tiny weeny pearls which are invisible to the naked eye ! ( all that without punctuation ! ) The image is courtesy of the Graphics fairy which I printed onto acetate and which is why the photo is rubbish ! I love working with the stuff but you just cant get a decent photo except if you want to see my ugly mug reflected in it and believe you me you don’t ! I would love to share the reverse side of this BUT ………….I Photo has decided that I do not have access to my own photos and has locked me out !!! obviously it is working in cohorts with my muse and they are trying to undermine my determination to go it alone ! My lack of muse I can fight but the loss of all my photos is a low blow looks like the Mac man is in for a visit ! Luckily this image was on my desktop so at least I could post that ! Please upload your entries by 28th of December to be in the running for a prize. Do pop on over to Get Creative to see what my fabulous team mates have come up with to inspire you . I am off to have a nervous breakdown preferably in the Mac mans office !